The New England Holocaust Memorial in Boston was vandalized on Monday. 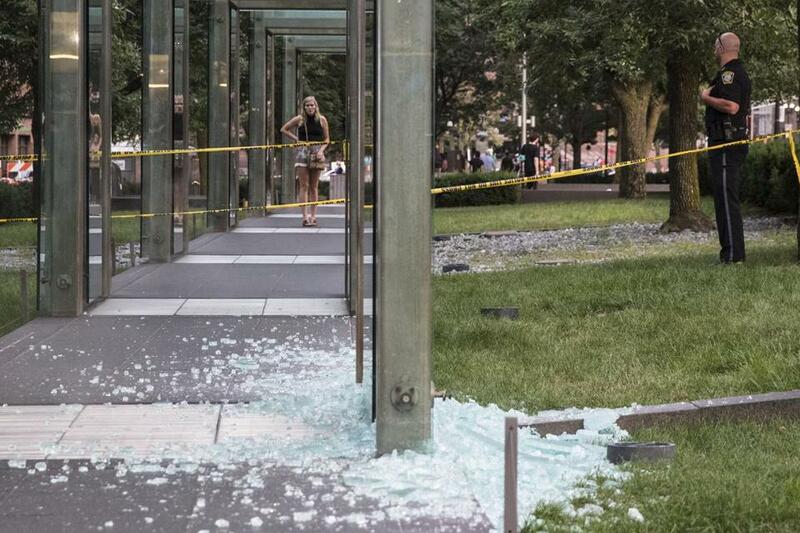 For the second time this summer, the New England Holocaust Memorial in Boston was vandalized when a 17-year-old allegedly threw a rock Monday evening through one of the glass panels, shattering it. The male teenager, who is from Malden, was quickly tackled by two bystanders and held until police arrived. He is charged with willful destruction of property, and police are investigating whether the incident was a hate crime. 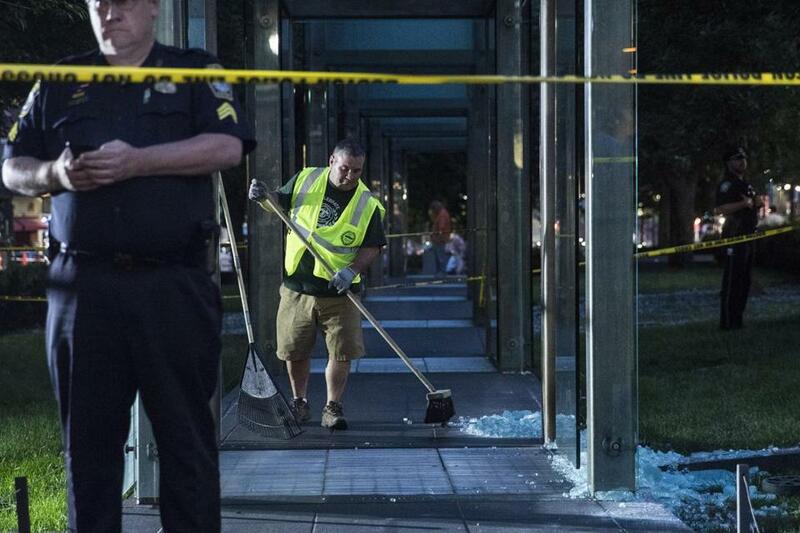 The vandalism, which happened just before 7 p.m., came just two days after a white nationalist rally in Charlottesville, Va. turned violent, and less than two months after a 21-year-old with a history of mental illness shattered a glass panel at the Boston memorial. The glass towers of the memorial, which was installed in 1995, had never been vandalized before the June incident. “It’s a reminder that we as a community need to be united, both in our opposition to all forms of hate but also in the important role that memorials play in our community,” said Robert Trestan, regional director of the Anti-Defamation League. Trestan said it was important to let the investigation unfold before jumping to conclusions, but said the destruction was jarring, no matter what the suspect’s motive was. “It’s a second blow to the community, and it comes at a time when most of Boston is standing in solidarity [against] the hatred that we saw in Charlottesville over the weekend,” he said. At the memorial, police tape cordoned off two of the glass towers, and public works crews scooped up the glass with shovels. Jeremy Burton, the executive director of the Jewish Community Relations Council, noted that the memorial in Boston stood for two decades before it was vandalized. Investigators looked at glass sitting on the ground after it was vandalized. Burton said the panels on the memorial are made from a “very resilient” glass. “I can only say from what I know of the June attack, it takes a very, very conscious effort to break this glass,” he said. Austin Giles was passing through the memorial and reading the panels, which bear numbers representing victims of the Holocaust, when he heard glass shatter on the opposite end. He saw police take the suspect into custody. Scott Strauss and his family, who are visiting from Miami, said his grandparents on both sides of his family were Auschwitz survivors, and he wanted to show the memorial to his children. “It’s just awful,” he said. When they went to cross the street, Pfeifer said, she and her friend saw a man with a hooded jacket standing right where the glass was. According to Pfeifer, the man put up his hood and ran through the memorial and across the street before he was tackled. Danielle Souza, 27, of Everett, said the timing of the vandalism was distressing. “Especially with everything going on right now, it breaks my heart,” Souza said. The memorial reopened around 9 p.m. A family with young children was the first to walk through. “It’s for the Holocaust,” the adults explained. Police said that at least one officer would be posted at the memorial throughout the night. 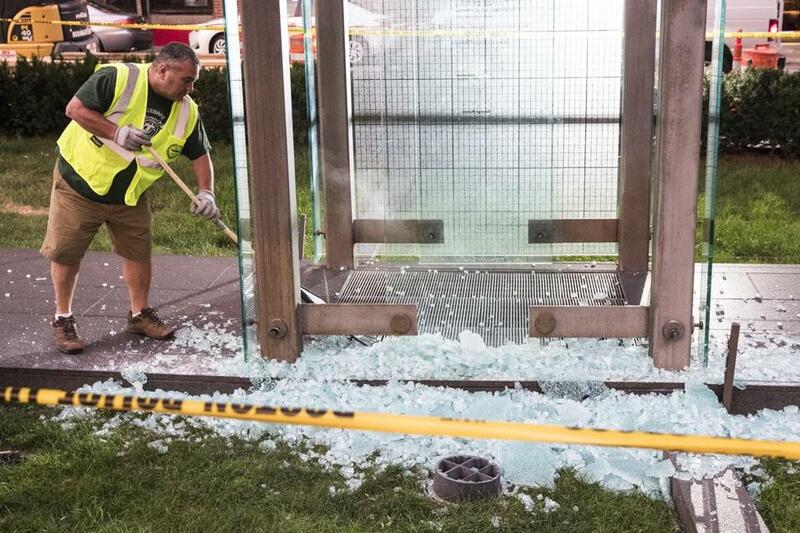 Employees cleaned up the shattered glass at the memorial. Emily Sweeney and Mark Arsenault of the Globe staff contributed to this report. Aimee Ortiz can be reached at aimee.ortiz@globe.com. Follow her on twitter @aimee_ortiz. Adam Vaccaro can be reached at adam.vaccaro@globe.com. Follow him on Twitter @adamtvaccaro. Reena Karasin can be reached at reena.karasin@globe.com. Follow her on Twitter @reenakarasin.